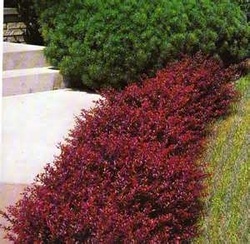 Crimson Pygmy Barberry is a small shrub that brightens up any landscape. Crimson Pygmy Barberry is small shrub getting only 2' high and about 3' wide. It is insect and disease resistant, deer don't like it and it needs no trimming. You can use this small shrub as a topiary and it goes well in a Japanese Garden and can be used as a Topiary plant. Plant Crimson Pygmy Barberry with gold, dark green or yellow plants for a sharp contrast in your landscape. Crimson Pigmy Barberry is also a Firewise plant. Crimson Pygmy Barberry likes to be planted in full sun.